Contains 16 different beauty ingredients to boost beauty. Uses pig-derived collagen. Collagen plus 16 beauty-boosting ingredients! 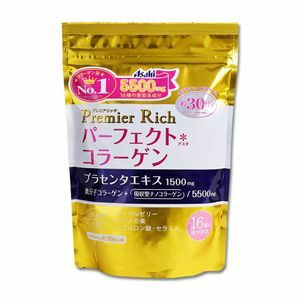 Asahi Perfect Asta Collagen Powder Premier Rich is a drinkable collagen supplement for firm, youthful looking skin. This supplement is an ideal way to reverse wrinkles and boost elasticity in the skin. It also helps maintain healthy, pain-free joints. Its easy to drink formula dissolves completely into food or drinks, and it contains a huge 5,500mg of collagen per serving! Asahi Perfect Asta Collagen Powder is made with low-molecular-weight and nano-collagen. This formula is more easily absorbed into the body, increasing the powder of the supplement! This premium collagen supplement also contains a wealth of other skincare ingredients, including hyaluronic acid for hydrated, plump skin, and generous amounts of placenta, ceramides, royal jelly, coenzyme Q10, and bird's nest essence. Many people buy these beauty supplements seperately for their incredible benefits. Taking them together in Asahi Perfect Asta Premier Rich is a convenient way to get an incredibly potent all-in-one beauty supplement with no fuss! Contents: This product contains 228g for a 30 day supply. How to use: Mix 1 spoonful of Asahi Perfect Asta Premier Rich Collagen powder daily into your choice of food or drink. Try mixing collagen into coffee, soups, yoghurts, smoothies, or even pancake mix! Please note that a measuring spoon does not come with this product. Collagen is an essential building block of our skin. However, as we age, our body slows down collagen production, which leads to a loss in skin elasticity and firmness. This is why supplementing our collagen that our body can easily use is such a miracle treatment for fighting the signs of aging. The Asahi Perfect Asta Collagen range is one of the best selling ranges of collagen products in Japan. As one of the most well known drink companies in the world, Asahi's trusted reputation makes this an easy choice for anyone looking for a high quality Japanese collagen supplement. You can shop the whole Asahi Perfect Asta range right here at Wonect.com! If you are looking for Asahi Perfect Asta collagen powders, jellies, or pre-bottled drinks, you can find them right here with fast shipping worldwide. Check out Wonect's full Asahi Perfect Asta Collagen range page here! Key ingredients: Low molecular collagen+Nano Collagen, Hyaluronic acid, Beauty makeup lactic-acid bacilli, Glucosamine, CoQ10, Vitamin C, Roman German chamomile, Chameleon plant, Western hawthorn, Grape leaves, Dietary fiber.Placenta, Ceramide, Royal jelly, Alpinia speciosa leaf, Bird's Nest essence. Looking for the best deals for Asahi Perfect Asta Premier Rich Collagen Powder?